Marshalltown City Hall is located in 24 North Center Street, Marshalltown, IA 50158; phone: 641-754-5799. Photo: Thaddeus Binford House, ca. 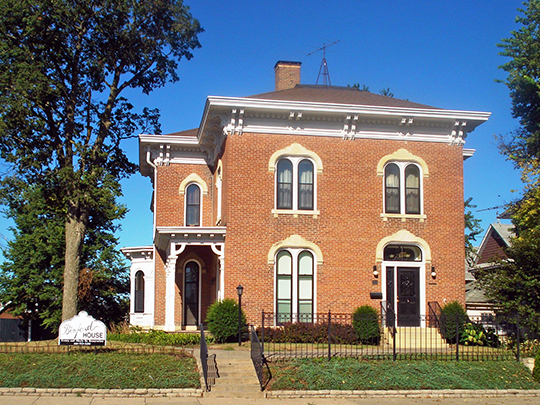 1874, 110 North 2nd Avenue, Marshalltown, IA. Listed on the National Register of Historic Places in 1984. Photographed by user:Kepper66 (own work), 2011, [cc-by-3.0 (creativecommons.org/licenses/by/3.0)], via Wikimedia Commons, accessed August, 2013. Marshalltown, industrial center and seat of Marshall County, is a city on the prairie, stenciled with railroad tracks and hard-surfaced highways and bordered on the north by the Iowa River. It is built around the courthouse, as is traditional with county seat towns in Iowa. The friendly dials of the clock tower, luminous above a fringe of green trees on Main Street, command the entire community. Farmers in "Sunday best" or everyday overalls, drive in from the country to transact business here and, lingering in the square, discuss the latest prices at the canning factory which contracts with them for sweet corn. Their wives and daughters, strolling along Main or Center Streets, window-gaze or purchase items on their shopping lists. A constant ebb and flow of foot and automobile traffic suggests the many brisk activities of the neighborhood. From the courthouse, the residence district spreads fan-wise toward the west and north. Most factories are in the southeast. Thousands of trees shade the wide boulevards; in the summer the city appears to be covered with arbors of green from which emerge smokestacks, the courthouse, and the tower of the Iowa Soldiers' Home in the northwest environs. Beyond Marshalltown's borders is the corn country flat, almost timber-less prairie extending for miles. Marshalltown's population is 91 percent native white; its factory and other workers being largely recruited from neighboring rural sections. The city was named for Marshall, Michigan, by the first permanent settler, Henry Anson, who emigrated from the East by covered wagon in the spring of 1851. The suffix "town" was added later to distinguish it from another town in the State. The first court of Marshall County (created in 1846) was held by Judge Williams in the fall of 1851 in John Rails' cabin in a grove north of Anson's home, and in the same year Marietta was chosen as the county seat. Henry Anson was furious. He roused his neighbors to action, insisting that their town should be chosen. The Marietta residents jeered at "Anson's Potato Patch." A bitter seven-year wrangle followed, drawn out by personal and political disputes and legal sparring. The Supreme Court of Iowa finally decided in favor of Marshalltown in December 1859. On June 1, 1859, a group of Marshalltown businessmen, headed by Greenleaf M. Woodbury, formed the Cedar Rapids & Missouri River Railroad Company in order to build a line west from Cedar Rapids to the Missouri River. The Government issued the company a land grant March 24, 1860, stipulating that the first 40 miles of the new road should be finished by January 1, 1862. A subscription list was started; those who could not spare money volunteered to work, give free board and room to other workers, or lend teams of horses. As the time limit approached, crews worked day and night to finish the required section of the road. The last spike was driven at midnight, December 31, 1861. A year later, January 1863, the line was completed to Marshalltown. Many men from Marshalltown and the surrounding country fought with the Union forces in the Civil War. A local unit, the Bowen Guard, was mustered into service July 1861 as Company D, 5th Iowa Infantry. W. P. Hepburn, Marshall County prosecuting attorney, organized a company of the Second Cavalry, serving as its captain. Marshalltown, incorporated in 1863, was one of several cities that held sanitary fairs that year. A large amount of money was raised and sent to the front to improve first aid and hospital work. Industrially the city's development began in the first years after the Civil War with the establishment of flannel, blanket, woolen goods, wagon and carriage factories and an iron foundry. Repair shops and terminal property of the Central Railroad of Iowa (Minneapolis & St. Louis) were located in Marshalltown when the railroad was built through in 1869. Twice during the 1870s flames threatened to destroy commercial Marshalltown. The first fire, May 2, 1872, spread rapidly, owing to a high wind, sweeping over an area of 15 acres and causing damages in excess of $200,000. The town was little more than rebuilt when, April 6, 1876, an other blaze burned $30,000 worth of elevators, warehouses, and lumber yards. When hospitalization of Civil War veterans became a matter for State consideration, Marshalltown offered to donate 28 acres of ground for a home. The city also raised $12,000, later increasing the amount to $30,000 and adding to the acreage. The General Assembly in 1887 accepted the offer, appropriating $100,000 for the erection and maintenance of an institution. When Henry Anson died November 30, 1905, at the age of 79, the city he founded and fostered was an important shopping and manufacturing center. Since that time, Marshalltown has quietly expanded its manufactures in keeping with changing times. In 1935 a local company made spot and taillight gaskets for more than 80 percent of American automobiles. A furnace manufacturing company brought out domestic air-conditioning equipment. Trowels, governors, and steam specialties are among the other products manufactured. Altogether 56 factories are in business, giving work to hundreds of local people and paying wages of $300,000 annually. Federal Writers' Project of the Works Progress Administration for the State of Iowa, Iowa: A Guide to the Hawkeye State, American Guide Series, The Viking Press, New York, 1938.